Dukes’ presence in the House is a sensitive topic for her colleagues in the Travis County delegation because of the 12-term Democrat’s legal issues. Rep. Dawnna Dukes is the elephant in the corner of the Texas House, and she knows it. Dukes’ presence in the House is a sensitive topic for her colleagues in the Travis County delegation because of the 12-term Democrat’s legal issues. Most of them said they have not had full conversations with Dukes since the session started Jan. 10. 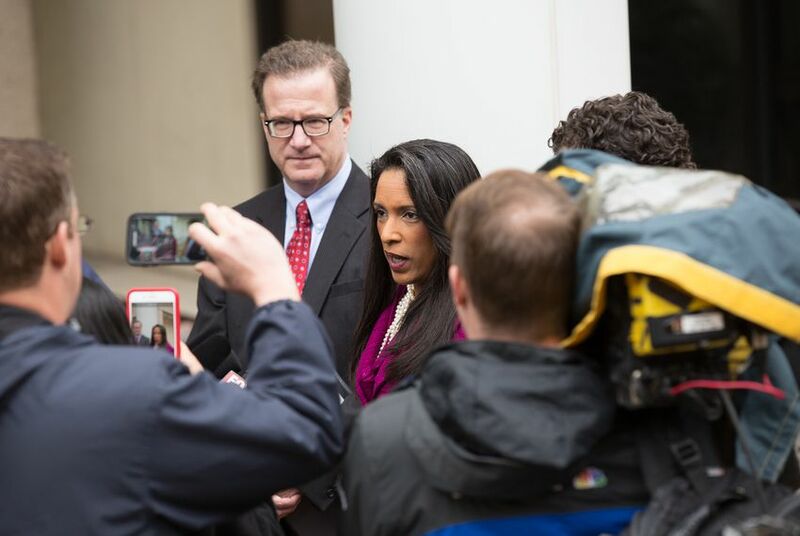 Dukes is facing a grand jury indictment and a shadow campaign for her seat after she announced she was resigning, then abruptly changed her mind. She’s been demoted to a smaller office and hasn’t filed any bills so far this legislative session. She’s had multiple absences already this session, and a sick child caused her to miss the first House Appropriations Committee hearing. Howard said she has had quick hellos with Dukes so far, but the delegation has not had a chance to do anything together or figure out what Dukes’ intentions are during the legislative session. Among the six other Travis County representatives, Dukes said Rep. Paul Workman, R-Austin, has been “very kind” and “welcoming” since the 85th Legislative session started last month. Workman later told the Tribune through a spokesperson, “It is ultimately up to the people of House District 46 to determine the fate of their representation in the Texas House of Representatives." Dukes is facing 28 years in jail and fines of up to $138,000 over abuse-of-office charges after a grand jury indicted her last month. Accused of falsifying travel vouchers and misusing staff, Dukes has pleaded not guilty. Under the state’s Election Code, even lawmakers who are convicted of crimes can keep their seat until they have exhausted all appeals. Dukes said she is busy training her staff and studying appropriations and legislation that will reshape the state’s child welfare system. While she has missed 11 days so far, Dukes wrote in a Feb. 13 Facebook post that senior members do other things at the start of session when the House agenda doesn’t include many major items. She said the downtime has allowed her team to unpack her new office and review budget and white papers on Child Protective Services. Dukes is also watching a mounting campaign for her seat if she resigns or is forced to step down. Former Austin Mayor Pro Tem Sheryl Cole, Austin attorney Jose “Chito” Vela, Austin technology executive Nnamdi Orakwue, community organizer Greg Harrington and Manor ISD Board Trustee Ana Cortez are just some of those who have expressed interest in Dukes’ seat. Democrats’ silence on Dukes’ legal troubles is “quite a bit” disturbing, said Andy Hogue, communications director for the Travis County Republican Party. He said the Travis County Democratic Party should issue a statement acknowledging Dukes’ indictment and making their expectations of elected officials clear. “The worst of it all is her saying, ‘I’m going to resign on this day’... and then said, ‘I guess my voice was needed,' you know, ‘me, me, me,’ as if no one else can speak to the issues that she advocates ... to me that’s something worthy of censure,” Hogue said. A grand jury has indicted state Rep. Dawnna Dukes, D-Austin, on abuse-of-office charges, the Travis County District Attorney's office said Wednesday. She could face up to 28 years in jail and fines of up to $138,000. Four Austin Democrats pitched ideas for representing House District 46, even though state Rep. Dawnna Dukes, D-Austin, abruptly decided not to step down from her seat.